"We should double the rate of growth, and we should double the size of the American economy!" hailed candidate Jack Kemp during the vice presidential debate of October 9, 1996. Kemp was firing away from the bandwagon, and there's never been a redder face under whiter hair. He knew Americans have long been instilled with the ideal that economic growth is good, that economic growth solves societal problems. He figured they would vote for the candidate who could pull off the most growth. Less emphatic, Kemp's opponent Al Gore nevertheless sanctioned the growth race with the impeccably wry retort, "Well, the economy is growing very strongly right now.... The average growth rate is also coming up. It is higher than in either of the last two Republican administrations." At face value, the argument that economic growth is good is hard to deny. After all, the economic growth of a nation is taken to mean that its citizens will be better fed, dressed, housed, educated, transported, and entertained. More MacDonald's and Antoine's, more Fords and Fiats, more jeep trails and ship sails. For rich and for poor, more quantity of more things. Twice as much, if we elect Jack Kemp. So economic growth leads to a better life, at least a better material life. This argument will be left intact for the time being. I mention it here only to explain the esteemed status of economic growth in the American psyche. How esteemed is the status? At the University of Arizona, I conducted a nationwide survey and simply asked people. I presented them with a series of concepts, and found that economic growth is valued at a level of 75.4 on an importance scale of zero to 100, putting it in the same category as property rights and species conservation (Czech and Krausman 1999). Democracy and ecosystem health were valued at an even higher level, but none of these were valued as highly as the availability of resources for posterity (at 85.8). So Americans value economic growth quite highly, but perhaps not insanely so. Another method with which to estimate esteem is to look at the news surrounding economic growth. Surely the newspapers wield a great influence on, and are affected by, the American attitude toward economic growth. I tapped into the National Newspaper Index, which catalogs articles from such bellwether papers as the New York Times, Washington Post, Wall Street Journal, and Los Angeles Times. From them are spawned many of the syndicated, copied, or emulated columns that grace the smaller rags throughout the nation. I searched for the phrase "economic growth" and found reference to 1,930 articles. In the uniform sample of every twentieth article I examined, economic growth was always treated as a desirable phenomenon. In nearly 15 percent of the articles, though the rate of growth for this or that region was considered too high, the propriety of growth itself was never questioned. No wonder Americans have such a positive view of economic growth! One especially attention-grabbing article was "Stupid students, smart economy?" in which Robert J. Samuelson (1998) entertained an argument that despite the education crisis perceived by many Americans, we shouldn't worry. In this view, the fact that economic growth continues is a sure sign of an intelligent, well-educated society. Imagine the sighs of relief such a proposal must have produced amidst the angst over American schools. But does a perpetual increase in American consumption of goods and services really mean that its citizens are smarter? Has there ever been a bigger dog wagged by a smaller tail? Then there is the evening news. Trends on Wall Street reflect the growth of the economy, and on each of the major broadcasting networks a stock market report is provided day in and day out. Gains on Wall Street are invariably presented as good news, while losses are decried, although perspective is sometimes evident to the extent that losses are termed "corrections." "Leading economic indicators" are also closely monitored. Housing starts, net corporate profits, and disposable income motivate Wall Street reaction. Again, upward trends are invariably portrayed as good. No other TV news topic receives daily monitoring at the national scale, suggesting that American society has no greater obsession than with economic growth—aforementioned survey results notwithstanding. In addition to our political leaders and news media, our bureaucracy upholds economic growth as a national goal. On the first page of her annual report for fiscal year 1992, Barbara Hackman Franklin (Republican Secretary of Commerce) said, "Recognizing that commerce has supplanted military and security issues as the main concerns among nations, the 14 diverse agencies that make up the Commerce Department rallied ... to advance a seven point agenda for fostering economic growth." Not to be outdone, in his annual report for fiscal year 1994, the late Ronald Brown (Democratic Secretary of Commerce) said, "The activities of the Department — promoting economic growth through [a myriad of techniques]—have worked in strategic harmony to provide increased economic security for all Americans." The primary, perennial, and bipartisan goal of this massive, cabinet-level department is economic growth. Even government agencies that are supposed to play an active role in conservation pursue the mission of economic growth. The Army Corps of Engineers, for example, is the oldest natural resource agency in the federal government and responsible for much of the nation's water quality and wetlands conservation. Since the 1970s, the Army Corps has defined its mission in terms of four programs: national economic development, regional economic development, environmental quality, and social well-being. In 1983, consistent with President Ronald Reagan's emphasis on regulatory impact assessment, the Corps formally prioritized economic development. Reflecting on trends in American economic policy since his stint as an economic advisor to President Richard Nixon, Herbert Stein lamented, "Growth is now the great god before whom all participants in the discussion of economic policy bow their knee. Merely to allege that a policy will promote growth is sufficient to make a case for it" (from Hamrin 1988:40). Understandably, American citizens can hardly resist the continually reinforcing influence of their news media, bipartisan politicians, and government. Or vice versa. But as one studies the phenomenon of economic growth as national ideal, one discovers that all the politicians, news reporters, and bureaucrats combined have only been following the lead of a privileged class of experts. After all, who wrote the syndicated column? Who did the reporter interview on the evening news? Who taught the politician, the bureaucrat, and the citizen what they know about economics? Why the economists, of course. Economics is a topic that most of us avoid due to its dry, mathematically tedious bearing. My introductory macroeconomics course at the University of Wisconsin had the highest proportion of sleepers of any class I've seen. Most of us bought class notes and just skipped the damned thing. The only thing that lifted the tedium was when a pigeon would get into the towering chamber of Bascom Hall, or when Professor Culbertson would flail away at an intrusive bumblebee. Leave it to Mother Nature to breathe some semblance of life into economics. We nevertheless live in a society shaped by economists. Malthus, Mill, and Marx established the great debates of Western civilization in the 1800s. They and their cohorts attained the ponderous status of "classical economists," partly in reference to their place in academic time. Thomas Malthus in 1805, for instance, became the first professor of political economy in the English-speaking world. Not coincidentally, it was also a time when a new, capitalistic society offered a way out of the dark ages of feudalistic warmongering, callous kings and queens, and bartering one's way to relative comfort. But "classical" best befits the fact that these economists were much more than number crunchers. The Adam Smiths and the David Ricardos spoke of big, classic issues like the power of nations, the distribution of wealth, and the limits of land. They were political philosophers and beacons of light in a truly new world order. As a group, they produced some of the most influential books ever written, including Wealth of Nations (Smith), An Essay on the Principle of Population (Malthus), and Principles of Political Economy (Ricardo). The field of economics, then, rests on a fabulous foundation of human thought. But something went awry in twentieth-century western economics. For one thing, it dropped the big issues. As Robert Heilbroner (1992:173) put it, "economics had ceased to be the proliferation of world views that, in the hands of now a philosopher [Smith], now a stockbroker [Ricardo], now a revolutionary [Marx], seemed to illuminate the whole avenue down which society was marching. It became instead the special province of professors, whose investigations threw out pinpoint beams rather than the wide-searching beacons of the earlier economists." This new brand of economics gradually distilled the classicists' efforts into a unified assumption that economic growth is good, pure and simple. So today in a typical introductory textbook (Ekelund and Tollison 1988:147), students read that "The overall goal of macroeconomic policy is the achievement of economic stabilization ... to attain maximum economic growth in the present and future." Economics thus became a science geared toward justifying and facilitating the pursuit of wealth by individuals and nations. In perhaps its most radical departure from the classicists, however, it adopted the assumption that there is no limit to economic growth. In the process, it misinterpreted Smith, denied Malthus and Mill, and ignored Marx. This twentieth-century school of thought came to be known as "neoclassical" (new and different) economics, and it is the mainstream economics today. When the word "economics" is used without any qualifying adjectives by a reporter, politician, or bureaucrat, it invariably means neoclassical economics. When someone speaks of an alternative school of economic thought, like "ecological economics" (which will be explained later), an adjective is used. But unless your reading interests take you deeply into the sphere of economics, the economics you encounter will almost certainly be neoclassical. Of course, as with most highly developed fields of study, there are alternative views of how the economics discipline may be classified. In one alternative, neoclassical economics was born with the tenure of Alfred Marshall at Cambridge in the late 1800s. In another, neoclassical economics is simply an elaboration of classical economics, both passing away around 1959 with the death of Arthur Pigou (chair of political economy at Cambridge from 1908 to 1944). In this view, the current predominant model is classified as Keynesian economics (a classification to be partly explained in the following paragraph and further in chapter 2). But most economics texts and practitioners employ the "neoclassical synthesis," classifying Keynesian economics as a special case of neoclassical theory, and that is the convention I will follow. All this may sound a bit confusing, but the important point is that neoclassical economics, in this book and in most others, refers to the collective body of economic theory that dominates economics today. Riding on the shoulders of the classical giants, the neoclassical economists' expertise has long been sought by politicians and high-level bureaucrats who want to know what actions to take to better the lot of humankind—not to mention obtaining more votes and bigger salaries. It all started when John Maynard Keynes, Marshall's star pupil and champion of macroeconomic manipulation, helped the western world to think it was figuring its way out of the Great Depression. But the thought that subsequent neoclassical economists could be wrong about the limits to economic growth has not received serious attention anywhere in mainstream society. Certain radical economists and many ecologists have objected, but their arguments are seldom heard outside of academia. That is partly because science is too dry for most Americans. After all, if you work forty hours a week and take care of a family, you don't want to read about dull serious stuff in your spare time. Also, people in academia (university professors, primarily) tend to be competitive and egotistical. You have to be competitive to make a living in academia, and competitiveness is a natural counterpart to egotism. Just like football players want to be known for gaining the most yards or scoring the most points, professors want to be known for having the most profound thoughts or publishing the most scientific journal articles. This is not to say that professors from the sciences never write for the general public. But few do regularly, and even fewer do successfully. In the sciences, you are trained not to write in an entertaining fashion that would be enjoyed by the general public. Science is dry stuff, and rightfully so. Dry language guards against the tainting of scientific findings by emotion, trickery, and in-efficiency. Thus and thankfully, Professor Bhaskar did not write, "Believe it or not, scientific development involves a pathetic dialogue of redundant taxonomic knowledge, on which good-ol'-boy 'realist' positions in the freakishly contorted theories of perception are found to pile like a lot of crap!" After years of writing for science journals, writing with some semblance of style, grace, or humor becomes a real challenge (note the preceding) that few scientists invest time in, especially when academic competition calls for continual scientific writing. But occasionally one encounters a professor who seems to care less about what other professors think than what the public thinks, and puts forth the effort. Outstanding examples from economics include Robert L. Heilbroner and John Kenneth Galbraith. In summary, economic growth is a cherished American ideal. It is touted by politicians of both parties, praised in newsprint, and monitored nightly on TV. It has long been a goal of our federal government, and supposedly has "surpassed military and security issues" as the prime federal concern. Trying to decide who is the driving force in this complicity of media, government, and citizens is a chicken/egg quandary. But aside from their historical value, chicken/egg arguments are always moot; once you have either, the other will follow. Even if the public were not enthralled with economic growth, surely it would become so given the continual psychological reinforcement of media and government minions. However, just as the chicken/egg argument overlooks the rooster, attributing America's obsession with economic growth to the public, government, or media overlooks the planter of the seed: the neoclassical growth economist. Americans have been conditioned to appreciate, cheer, and serve economic growth. Brian Czech argues that, while economic growth was a good thing for much of American history, somewhere along the way it turned bad, depleting resources, polluting the environment, and threatening posterity. Yet growth remains a top priority of the public and polity. In this revolutionary manifesto, Czech knocks economic growth off the pedestal of American ideology. Seeking nothing less than a fundamental change in public opinion, Czech makes a bold plea for castigating society’s biggest spenders and sets the stage for the "steady state revolution." 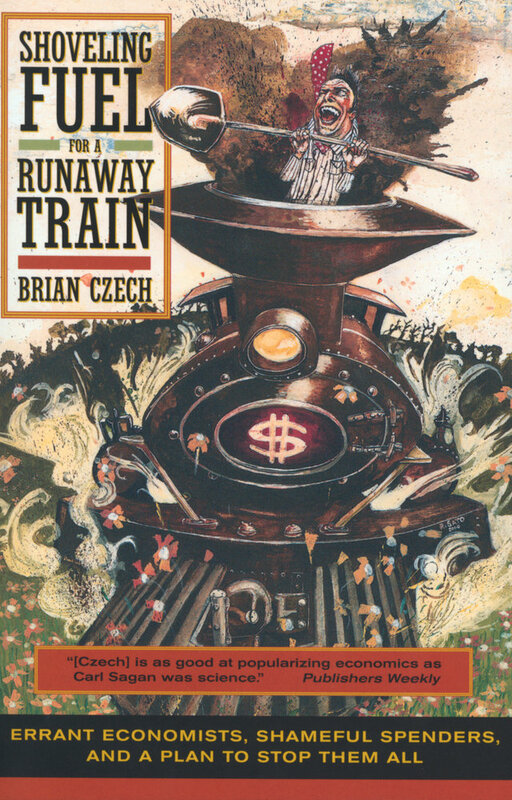 Czech offers a sophisticated yet accessible critique of the principles of economic growth theory and the fallacious extension of these principles into the "pop economics" of Julian Simon and others. He points with hope to the new discipline of ecological economics, which prescribes the steady state economy as a sustainable alternative to economic growth. Czech explores the psychological underpinnings of our consumer culture by synthesizing theories of Charles Darwin, Thorstein Veblen, and Abraham Maslow. Speaking to ordinary American citizens, he urges us to recognize conspicuous consumers for who they are—bad citizens who are liquidating our grandkids’ future. Combining insights from economics, psychology, and ecology with a large dose of common sense, Czech drafts a blueprint for a more satisfying and sustainable society. His ideas reach deeply into our everyday lives as he asks us to re-examine our perspectives on everything from our shopping habits to romance. From his perspective as a wildlife ecologist, Czech draws revealing parallels between the economy of nature and the human economy. His style is lively, easy to read, humorous, and bound to be controversial. Czech will provoke all of us to ask when we will stop the runaway train of economic growth. His book answers the question, "How do we do it?" Brian Czech is a conservation biologist with the federal government and an adjunct professor at Virginia Polytechnic Institute and State University. He is coauthor of The Endangered Species Act: History, Conservation Biology, and Public Policy (2001). 2. What Did Jack Kemp Really Say? 3. What Will They Think of Next, and Why? 5. Copernicus, Are You Out There?